Peace and quiet for a rest in a nature preserve! Escape and enjoy the unspoiled nature! near the Gorges du Verdon, beautiful lavender fields of the Valensole plateau and close to Digne les Bains: Provencal farmhouse comfortable 88 m2 -Furnished for 5 people - 4 rooms - located near the Col du Corobin on Napoleon Road; in the countryside with extraordinary views of the mountain and its wonders. Superb environment to fully enjoy the calm and serenity of the mountains and enjoy a truly relaxing holiday. At Chaudon you will be warmly welcomed by Françoise and Bernard in the UNIQUE LOCATION of the property. You can enjoy the pool just for you! a must ! Your cottage is composed of 4 rooms: 2 bedrooms (1 double-bed for the first and 3 single beds for the second modular) each with sink and shower (solar hot water for 80%), living room with sofa and rustic fireplace with views garden and pool, fully equipped kitchen (oven / microwave, fridge-freezer, dishwasher, washing machine), terrace with garden furniture and barbecue, separate toilet. Baby bed, chair Baby changing table. Decoration. EVO Bike Park for mountain biking on Digne les Bains. Located in the capital of the Alpes de Haute Provence, the Bike Park will offer you a service of lifts in vehicles equipped with bike trailers, tracks for the practices of the Downhill, Enduro and Dirt and a Pumptrack and an AirBag. The two bedrooms each have a toilet with sink and shower (solar hot water and electric balloon aid). In the bathroom of the parents we have also arranged a washing machine. Irons and table are available. We were a little dubious when we were driving to Chaudon. The road is extremely windy and very narrow in places - not for the feint-hearted! However, once we arrived it was worth it - the views are amazing and the peace and quiet unbelievable. If you need mobile access (as we did for work reasons) it's not the best place to stay, but we managed to find a spot in the garden where we could get a signal. The gite is comfortable but there's only one toilet downstairs - with no wash basin (fortunately we had hand sanitiser with us!) We were only given one towel each for 5 days which we had to use for showers and the swimming pool - to be fair, I did keep meaning to ask for additional towels but kept forgetting so we had to manage. The swimming pool makes this place - you can stay by the pool all day and just enjoy the sunshine and peace and quiet. We did this for a couple of days which was lovely. We visited the Verdon Gorge which is amazing and even had a go at paragliding - highly recommended. If you want somewhere extremely relaxing to stay and you don't mind travelling 12 miles to the nearest big supermarket - this is your place! Stayed here with 2 children after a week on the Cote d'Azur. A peaceful location and great to get away from everything. Very comfortable accommodation with cosy living room, modern kitchen and huge master bed. The pool was a big hit with the kids. Bernard & Francoise were very friendly, helpful and on hand. The children loved the various animals. Lots of activities within easy reach, but a car is a must. A great holiday. Nous avons été enchantés de faire votre connaissance.Votre satisfaction est notre plus belle récompense ! Nous serons ravis de vous recevoir à nouveau quand vous le souhaiterez ! 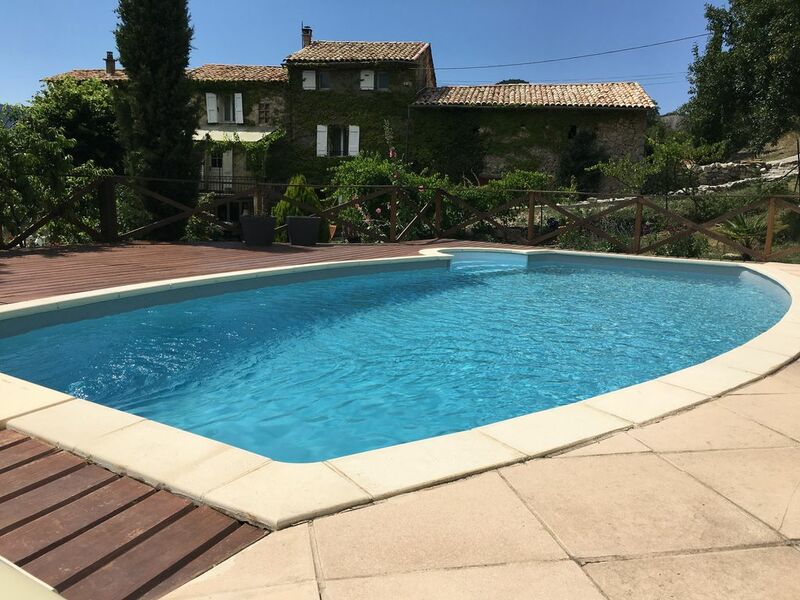 The Gite is very adequate accommodation for a good weather holiday stay. It is a small holding and so there are goats and chickens , which make it very homely. We ate outside all the time and so were able to enjoy the stunning views from the property, which are extraordinarily beautiful. Inside is very cosy, if a bit dark & offering little of the view of the magnificent outdoors. We were very happy to self-cater as the closest restaurant is 8 km away down a narrow windy road! This is also shopping and a bar in the same location. We chose the Gite for the walking and were not at all disappointed as we had some of the best walks ever and would return happily. There are many other activities close by and plenty for children of all ages. The owners were kindness and thoughtfulness personified. Wer Ruhe und Abgeschiedenheit sucht, der wird hier fündig. Die Unterkunft ist gut ausgestattet, der Garten mit Super-Blick auf die Berge wunderschön und der Pool lädt zum schwimmen ein. Für uns war es wunderbar! Wohnung wie beschrieben. Sehr nette Vermieter. Nur mit den Deutsch und Englisch Kenntnissen da muss man noch dran arbeiten. Aber die Verständigung funktioniert. Sehr schöne Lage und super zum Entspannen. Das Ferienhaus ist vollständig ausgestattet, mit Liebe eingerichtet und sehr gepflegt. Die Vermieter Francoise und Bernard sind zwei sehr liebenswürdige, hilfsbereite Menschen. Sie hatten gute Tips zu den Einkaufsmöglichkeiten in der Umgebung und auch zu der einen oder anderen Wanderstrecke im Umland. Die gesamte Umgebung bietet zahlreiche Wandermöglichkeiten und die Natur ist einfach beeindruckend. Wir haben die Zeit sehr genossen. Die Ruhe war einfach schön. Wir können dieses Ferienhaus mit bestem Gewissen weiterempfehlen. Uns hat es dort an nichts gefehlt und wir werden nächstes Jahr wiederkommen. Die Urlaubsplanung läuft schon. Merci Francoise et Bernard pour les beaux moments dans votre "Gite-Napoleon". The property is located in the mountains at 1050m altitude facing South. Digne les Bains and 25 minutes drive by the collar and Barreme is a 1/4 hour drive. The Gorges du Verdon and lakes are located about 40 minutes from the house. Golf: Golf lavender (18 holes) of Digne les Bains is located 20 minutes from our house. Worthy of golf consists of 2 courses: a compact 6-hole course and an 18 hole. It has the distinction of being technical and stunning views towards the mountains in the middle of lavender and ancient oaks fields. Ski: We are close (45 minutes) from the resort of Val d'Allos: A huge ski area and for all: space and altitude! With 230 kilometers of pistes, Val d'Allos is part of the largest French ski areas. the ski areas of Val d'Allos is up to the desires of each of the expert skier to the beginner. La réservation sera effective après que le propriétaire ait vérifié la disponibilité du gîte aux périodes choisies. La réservation sera définitive après que le locataire ait fait parvenir au propriétaire des arrhes représentant 30 % du montant total de la location. En option, vous pourrez louer le linge de lit au prix de 10 €/séjour /lit à régler en arrivant dans le gîte.